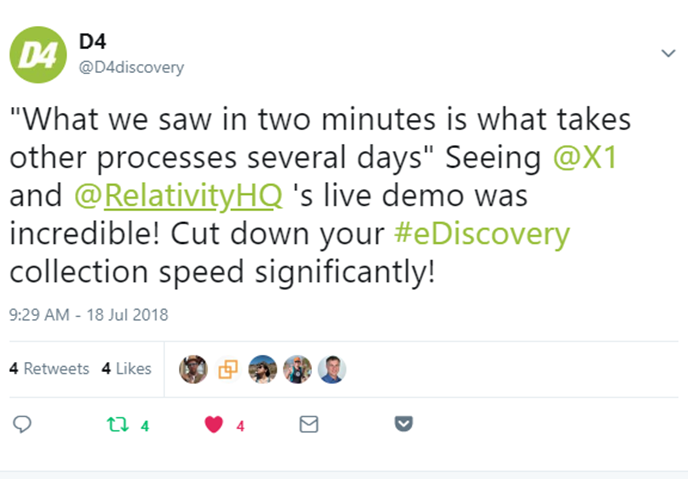 Last week we hosted a webinar with Relativity and D4, which highlighted the very compelling integration of our X1 Distributed Discover solution with the Relativity platform, including RelativityOne. This integration is important as it provides game-changing efficiencies in the eDiscovery process by accelerating speed to review, and enabling more intelligent decision making. The webinar featured live demonstration showing X1 quickly collecting data across multiple custodians and seamlessly importing that data into RelativityOne in less than two minutes. With the ability to search and collect emails and documents across up to thousands of endpoints and network sources with industry-leading speed, X1 Distributed Discovery revolutionizes enterprise eDiscovery. For example, X1 empowers legal and consulting teams to iterate their search parameters in real time before collection, providing a revolutionary true pre-collection early case assessment capability. Additionally, with its intelligent collection capability, X1 performs instantaneous data processing (culling, de-duplication, text and metadata extraction, etc) in a fully automated manner. The X1 and Relativity integration addresses several pain points in the existing eDiscovery process. For one there, is currently an inability to quickly search across all unstructured data, meaning eDiscovery teams have to spend weeks or even months to collect data as required by other cumbersome solutions. Additionally, using ESI processing methods that involve appliances that are not integrated with the collection will significantly increase cost and time delays. So in terms of the big picture, with this integration providing a complete platform for efficient data search, eDiscovery and review across the enterprise, organizations are going to save a lot of time, save a lot of money, and be able to make faster and better decisions. When you accelerate the speed to review and eliminate over collection, you are going to have much better early insight into your data and increase efficiencies on many levels. View the on-demand webinar see first hand the capabilities of X1 and Relativity by clicking here.